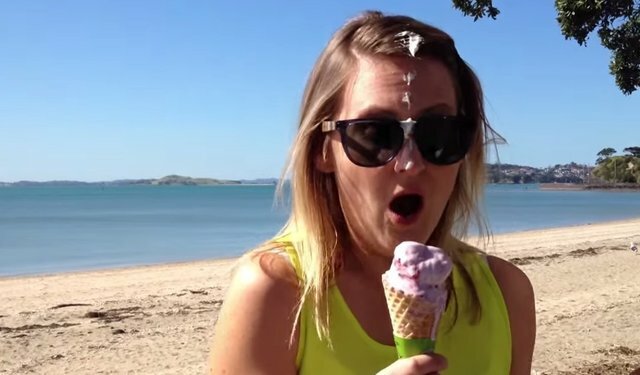 Late last week, the internet stood aghast after a video posted online appeared to show a young lady, unaware that a bird had just done its business on her ice cream cone, consuming avian feces without batting an eye. Then, moments later, the bird strikes again, this time hitting her with poop that lands right on her face. The Dodo reached out to experts who, thanks to their years of experience working with birds, know a thing or two about their number two. "The mass that hits her head seems both exceptionally large and of a consistency that looks more like ice cream than bird crap. That said, they are on a beach where there might be gulls passing overhead and they can produce a large splat. Still, I don't think it would look like this stuff, there's just too much bulk to it." "Can't say I'm truly an expert on bird poop, but as a birder and someone who has researched in colonial nest sites and been covered in it, I never would have guessed that was bird poop by the consistency of it." "[The poop] doesn't seem to drop quickly enough, for the quantity. Even if the bird was only a few feet above her head, it should have dropped more quickly, also, it's pretty thick and appears to be all urates–not likely. And she licks right where the first poop landed in her ice cream, it would have tasted awful and I suspect she would have made a face or noticed in some way." Unless creators of the poop video come forward, we may never know for certain if it was staged or not - though judging from the insight of experts, chances are it's more bull than bird.